Heat oven to 350°F (325°F for dark or nonstick pans). In large bowl, mix cake mix, oil and eggs until soft dough forms. Shape dough into 1-inch balls. Place balls 2 inches apart on ungreased cookie sheets. Bake 8 to 10 minutes or until set. Cool 5 minutes; remove from cookie sheets to cooling rack. Cool completely, about 30 minutes. Divide frosting into 3 small bowls. Tint frosting as desired with food colors. Place frosting in small resealable food-storage plastic bags or disposable decorating bags. Cut off tip of each bag to make 1/4-inch opening. Pipe 1-inch circle of frosting on top center of each cookie. Sprinkle frosting with candy sprinkles. Press 1 milk chocolate candy into frosting on each cookie. Store cookies tightly covered. For easy cleanup, before placing cookie dough balls on cookie sheets, line sheets with cooking parchment paper. 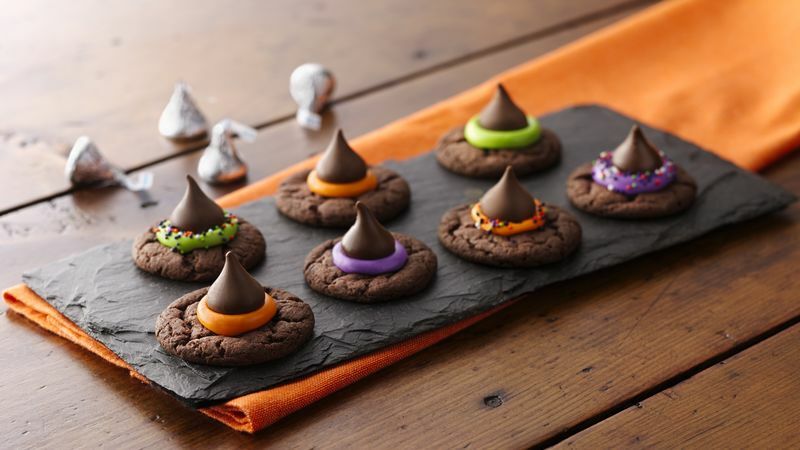 For more wacky fun, host a Halloween party, and let guests decorate their own cookies. Bake the cookies ahead, then put out the cookies, sprinkles, candy and colored frosting, and let your guests create!